"I believe I'm the best in the world, and I can beat anyone in the division." Callum Smith expects his first WBA title defence to be confirmed in the next few weeks and intends to strengthen his status as the world's No 1 super-middleweight. 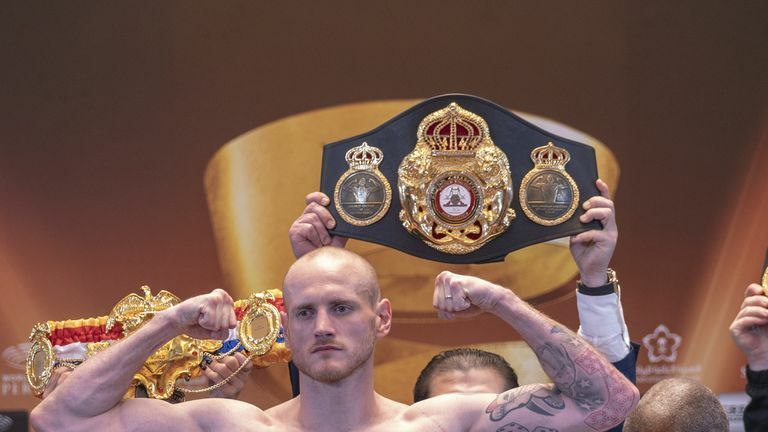 The 28-year-old held a meeting last week with promoter Eddie Hearn to discuss potential opponents as he prepares to start his reign as WBA 'super' champion after defeating George Groves in the World Boxing Super Series final in September. Smith had been linked with unification fights against WBO champion Gilberto Ramirez and new IBF title holder Caleb Plant, while big names such as Andre Ward and Gennady 'GGG' Golovkin have also been mentioned as possible foes for the future. "I think it will be confirmed within the next couple of weeks," Smith told Sky Sports. "Hopefully that's the plan, to get something out pretty soon. But I'm back in the gym and enjoying training again, and looking forward to getting back in there." Asked for an ideal name, Smith said: "I'll leave that to Eddie, I always have done. He's always seemed to put the right opponents in front of me. Whoever it is, I'm confident that I'll have the beating of them. "I believe I'm the best in the world, and I can beat anyone in the division. Whoever it is, I'm confident that I'll have the beating of them." Smith has already begun preparations for his next fight, linking up with long-term trainer and manager Joe Gallagher, and intends to dominate a division that also includes James DeGale and Chris Eubank Jr, who will settle their own rivalry in February. "We're looking at the best options," said Smith. "Sending through a list of opponents and options, and stuff like that, and we'll sit down and look at the best one. "Just good to be back training, and back with my boxing head on now, and look to the future. "Like I said before, there's big fights for me to be involved in, and I'm looking forward to it." Ambitious plans for a homecoming fight at Anfield have been put on ice, partly due to the cost of hiring out the 54,000-seater stadium. The Liverpudlian said: "I don't really get involved too much in all the negotiations with it, but there was a few stumbling blocks, and when I spoke to Eddie the other day, he never really spoke much about Anfield, which makes me guess that I think it's off the table for the time being."